1. Big week for trade: President Donald Trump is planning to impose a fresh round of tariffs targeting about $200 billion in Chinese goods as early as Monday, The Wall Street Journal reported. The timing of the announcement is fluid, two people familiar with the plans have told CNN. The Wall Street Journal reported that Beijing could scuttle a visit to Washington by a top economic policy official if Trump moves forward with the tariffs. "China is not going to negotiate with a gun pointed to its head," the newspaper quoted a senior Chinese official saying. New US tariffs would mark a significant escalation in the trade war with China, which has promised to retaliate with measures targeting American exports worth $60 billion. 2. Another problem at Tesla? The electric-car maker has struggled to ramp up production of its Model 3. But CEO Elon Musk says he's now having trouble getting the vehicles to customers. "We've gone from production hell to delivery logistics hell," he told a Twitter user who complained that the Tesla (TSLA) she had ordered was stuck at a railway depot. While it's not clear how many cars are waiting to be delivered, Musk said this problem is "far more tractable" that production delays. "We're making rapid progress," he said on Twitter. "Should be solved shortly." 3. Amazon investigates: Amazon is investigating allegations that some of its employees have offered to leak confidential information and delete negative product reviews in exchange for money. Amazon (AMZN) staff members are reportedly peddling internal data and other advantages that independent merchants can use to try to get higher rankings for their products in searches on the site. The Wall Street Journal, which first reported the story, said the practice is "particularly pronounced in China." An Amazon spokeswoman told CNN that the company has launched an investigation into the claims. 4. Global market overview: US stock futures were slightly higher. European markets dropped in early trade. Major indexes in China shed more than 1%. Japanese markets were closed for a holiday. 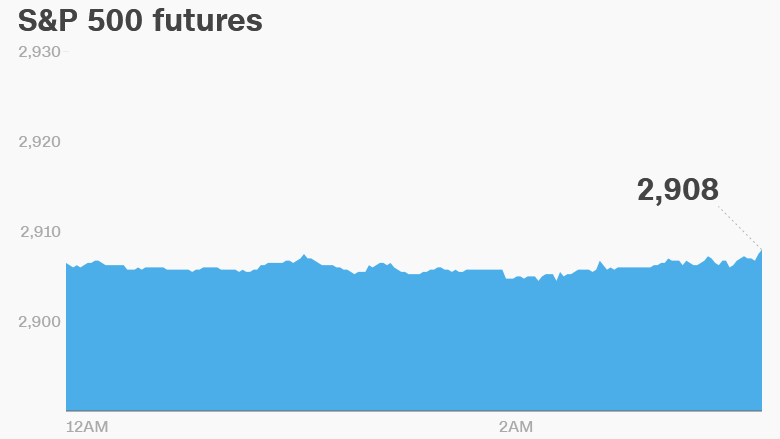 US stocks were flat on Friday. But all three major indexes advanced 1% on the week. 5. Companies and economics: FedEx (FDX) and Oracle (ORCL) will release earnings after the US close. H&M (HMRZF) said that third quarter sales increased 9% over the previous year to 55.8 billion Swedish kronor ($6.2 billion). UnionPay is preparing to launch branded cards in the United Kingdom, according to the Financial Times. That would put the Chinese firm in direct competition with Visa (V) and MasterCard (MA) in Europe. The Indian rupee dropped further on Monday despite government efforts to stop its slide. India announced a series of measures to prop up the currency over the weekend, but the proposals were light on detail. The rupee has fallen more than 10% against the US dollar this year, stoking inflation in the world's fastest growing major economy. The International Monetary Fund releases its regular report on the health of the UK economy at the start of a week that will see talks between Britain and its EU partners on Brexit.